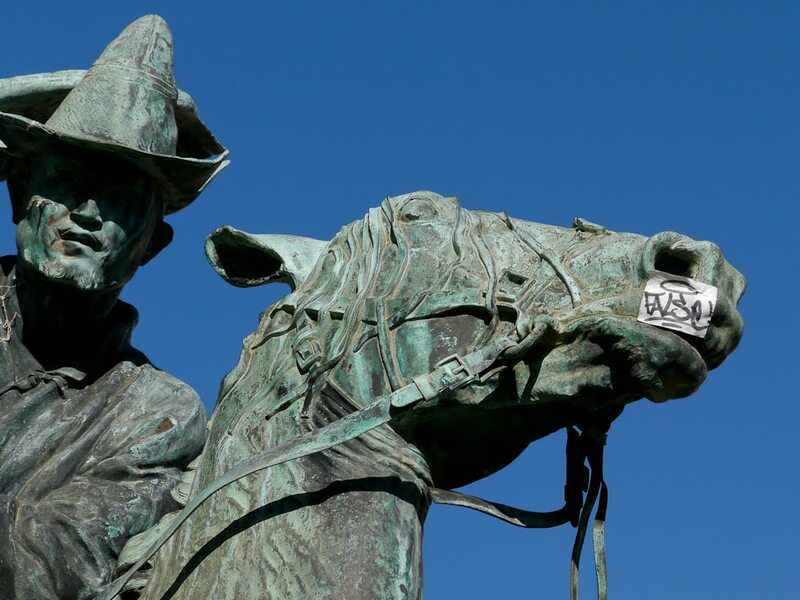 Why would someone stick a piece of paper on the horse's nose? There's another further down on the neck too - see smaller photo. This sculpture stands in the Jardins Biovès and was taken a month ago, when we had blue skies and not today's grey, rain and cold. 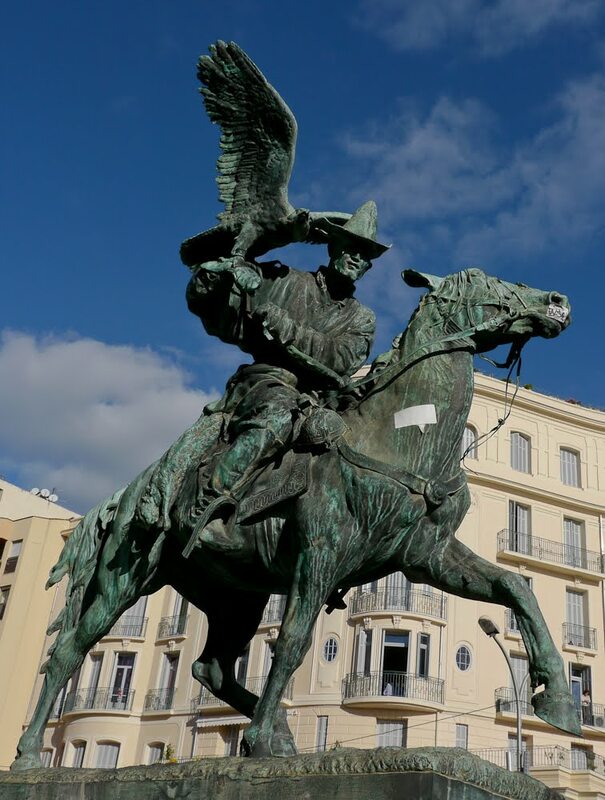 'Hunting the Berkout' was created by Russian sculptor, Eugene Alexandrovich Lanceray. The Berkout is a Siberian eagle. Pourquoi a-t-on collé un morceau de papier sur le nez du cheval? Il y en a aussi un autre plus bas sur le cou - voir la petite photo. Cette sculpture se trouve dans les Jardins Biovès et a été photographiée il y a un mois, lorsque nous avions encore un ciel bleu et non pas gris comme aujourd'hui avec de la pluie et du froid. 'La chasse au Berkout' sculptée par le russe Eugène Alexandrovitch Lanceray. Le Berkout est un aigle de Sibérie. One always wonders at the absurdity of the humans around us. Is that a message on the nose-paper? At least, it's easier to take off than a graffiti..
Blue sky?..I have difficulties to remember it! did not see it since sooo long!! Looks as if the horse has some bandages on. I guess we should be thankful their paint would not stick, or better yet, they knew better than to defile such a lovely statue with their ugly graffiti. And what's with the grey weather! It is hard to recall two days in a row in Menton without at least a little sun sometime during the day. Beats me. The world is loaded with idiots. It's a little hard to tell, but the sticker on the horse's mouth seems to contain the English word "false." I don't know anything about the sculptor or the work's context but maybe you have some art anarchists creeping around the Riviera.